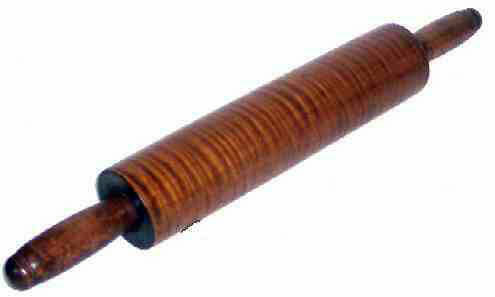 Presented here, from our collection of Rolling Pins, we are pleased to present a fabulous one made of Tiger Maple. Lathe turned and hand made, it dates from the second quarter of the 1800's and is in excellent condition and has been "road tested". It is 21-1/2" long and 3" in diameter with a good "heft" to it. We can personally vouch for the excellent pie crust and biscuits it makes. To display as a collection or to use . . . Buyer's Choice. Personally I use mine and the wonderful feel of it in my hands and visual impact of the figured wood gives much pleasure and makes a kitchen project a pleasure. These make great gifts for someone who likes to bake. I would imagine the giver would also be the beneficiary of some home baked goodies in return. ENJOY!